Leader of opposition in AP Assembly and YSRCP president YS Jagan Mohan Reddy assured the people of the state that all domestic expenditure of the poor would be waived totally. He also promised a payment of Rs 24,000 to every weaver family which owned a loom. 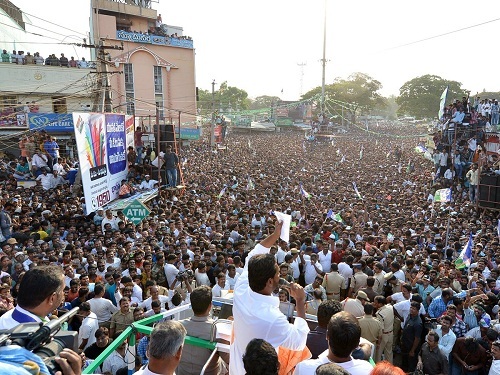 The YSRCP chief was addressing a large election rally at Madanapalle in Chittoor district. YS Jagan said that farmers would get minimum support price. Under Rajanna Rajyam, their lives will be filled with cheer and all segments of society will prosper through a system of welfare governance based on Navarathnalu. Addressing a huge crowd of YSRCP supporters and the general public, the AP Leader of opposition pointed out that he had earlier reached out to the masses of the state through his 3648-km long padayatra. Chandrababu Naidu had created a system of middlemen in which farmers found themselves at the receiving end, Heritage company owned by his family prospered, conversely. It was at the expense of farmers that Heritage saw a spurt in its growth, the YSRCP chief pointed out and cited the example of Chittoor dairy. This successful cooperative enterprise was slowly driven to a stage of burial by Chandrababu for the sake of Heritage, he remarked. YS Jagan recalled that he had met families of weavers here during the course of his padayatra. YS Jagan recalled that the Handri Neeva project had been completed for the most part during Dr YSR's tenure and the late chief minister had also ensured the completion of canal. Under Dr YSR, the cost of the project was Rs 4,076 Crores and 80% of the work had been completed. Chandrababu had taken huge kickbacks to complete the remaining 20%, said the YSRCP chief. YS Jagan also assured the large gathering present there that the fee reimbursement scheme would be taken up on a war footing once YSRCP comes to o power. 108 and 104 services also would be restored to their former glory, he assured people of the state. Similarly, he said that security of women would be a priority under Rajanna Rajyam. He appealed to the voters of Andhra Pradesh not to be lured by moneybags which Chandrababu would offer to them in exchange for votes but to think about the long term future of the state. He urged the voters to exercise their franchise wisely and vote for the YSR Congress Party.